You can copy or cut a chunk of text on your iPod touch and paste it into another app — for example, you can copy a paragraph from a note in Notes and paste it into an e-mail message in Mail, or vice versa. 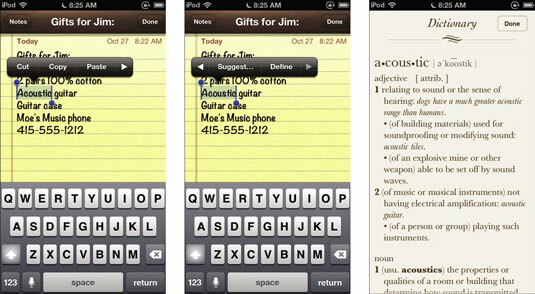 You can even copy paragraphs from a web page and paste them in Notes or an e-mail message. To copy a single word, double-tap the word. The word appears selected with handles on either end of the selection and a Copy bubble above it. Tap Copy to copy the word. To do more than just copy a single word, touch an insertion point first, so that the keyboard appears, and then double-tap the word. The Cut/Copy/Paste bubble appears above it with a right-arrow icon showing more options (Paste appears in the bubble if text has already been cut or copied). Tap the right-arrow icon to show Suggest and Define in the bubble. You can then tap Suggest to suggest a spelling for the selected word. You can also see a definition of a word by tapping Define. The dictionary definition appears. Tap Done to return to your note. Now that the keyboard is visible for editing, you can also select the nearest word or the entire text by touching and holding an insertion point to bring up the magnifier, and then releasing to show the Select/Select All/Paste (or Select/Select All) bubble. 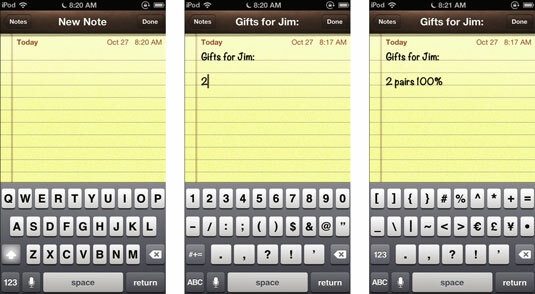 You can then tap Select to select the nearest word or tap Select All to select all the text. The Cut/Copy/Paste (or Cut/Copy) bubble appears above the text, which is selected with handles on either end. Tap Cut to cut the selection, or Copy to copy it. You can also make a more precise selection by dragging one of the handles. A rectangular magnifier appears for dragging the handle precisely. After you remove your finger to stop dragging, the Cut/Copy/Paste bubble appears for copying (or cutting) the selection. Tap Copy to copy the selection or Cut to cut it. 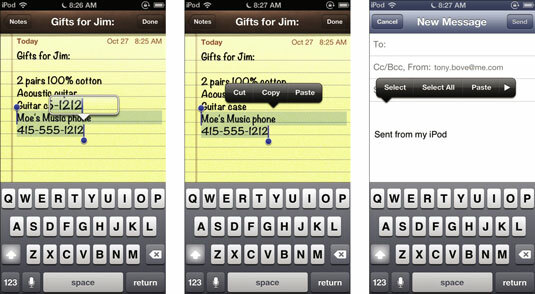 To paste the copied or cut text somewhere new, open a note (or create a new note) in Notes, or start a new e-mail message, or open any app that lets you enter text. Touch and hold to magnify the text view so that you can mark an insertion point precisely. After you remove your finger, the Cut/Copy/Paste bubble appears, or if the message or note already contains text (such as the “Sent from my iPod” message that appears automatically as part of your signature in an e-mail message), the Select/Select All/Paste bubble appears. Either way, you can then tap Paste to paste the text at the insertion point, and it shows up in your message.